The way we move through life truly comes down to our perspective. I knew my job going forward was to change my perspective in many areas. I had to approach my life the same way I approached making money. I needed to start living my life for a living. If you want to be extraordinary in all areas of your life, including family, fitness, faith, and fortune, it starts with purpose and the right perspective. I was stuck on that idea for a long time, and all it got me was frustration. I eventually realized that I was chasing the wrong thing. Passion is hard to find because it’s not the natural starting point of your journey to extraordinary achievement. If you’re looking for a train, you’re better off looking for a train station. If you need food, go to the supermarket. If you want to find your passion, start with a purpose. Passion is not the initiator. It is the byproduct of finding your purpose and then being committed to pursuing it. Remember this formula: Purpose + Commitment = Passion. I had been chasing passion and, to some degree, coming up empty. Now I knew I’d been chasing the wrong thing. I had to begin pursuing purpose and passion would follow. 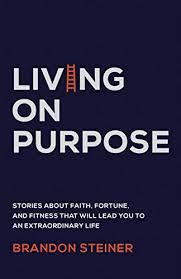 Living on Purpose, by Brandon Steiner. Copyright © 2019 by Brandon Steiner. You can buy Brandon’s new book here. Browse Brandon Steiner’s content on BetterListen here.